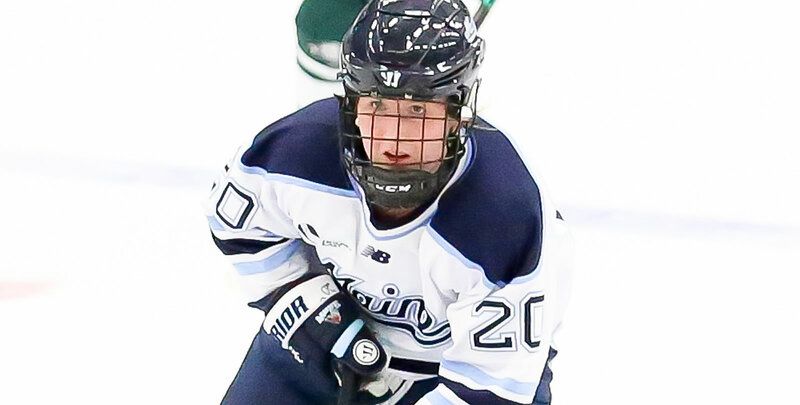 ORONO, Maine - The University of Maine women's ice hockey team earned a commanding 5-1 victory over the University of Connecticut Huskies on Friday afternoon in the Alfond Arena. The Black Bears three goal second propelled Maine to a win, their fifth this year scoring five or more. Maine is now 14-10-2 on the year, and 7-10-2 in conference play. First Goal (Maine 1-0): Celine Tedenby intercepted a UConn pass at center ice and reversed directions as Tereza Vanisova, joined the rush. Tedenby pulled the defense to her, giving Vanisova room as received the puck and fired in a hard shot to gave Maine a lead in the waning seconds of the first period. Second Goal (2-0 Maine): After assisting on the first goal, Tedenby scored a goal of her own. The freshman fired a shot from the face-off circle cutting in from the boards unchallenged. Her quick release had enough to break through Morgan Fisher's initial save before continuing to trickle through five hole and in. Third Goal (3-0 Maine): The defense chased Miljone down the boards as she caught some of the defense on a change, cutting across as Tedenby flew down the center slot, tipping in Miljone's pass in for her second goal of the game. Fourth Goal (4-0 Maine): Michelle Weis joined her linemates as she scored a goal with 6:08 left in the second period. Vanisova left the puck for Weis as she wired a puck from the nearside face-off circle. Her shot found the back of the net and gave the Black Bears a 4-0 lead. Fifth Goal (4-1 Maine): After intercepting a Maine pass, Briana Colangelo had a breakaway chance. The junior took full advantage of her empty sheet of ice and scored UConn's first goal of the contest. Sixth Goal (5-1 Maine): Maddie Giordano finished the afternoon with an empty net for the Black Bears. The final tally gave Maine a 5-1 lead which they would hold onto for their seventh Hockey East victory of the season. - Carly Jackson finished the game with 24 saves, while Morgan Fisher tallied 16 for the Huskies before she was replaced by Samantha Carpenter-Yelle, who recorded four saves. - The Black Bears went 4-for-4 on the penalty kill, including an extending 6-on-3 when the Huskies worked with an empty net on a power play. - Maine blocked 15 shots during the first game of the weekend. The two Hockey East rivals will do battle tomorrow, Saturday, January 26th. Puck drop is scheduled for 2:00 pm.